I had my first successful trans-Atlantic venture! 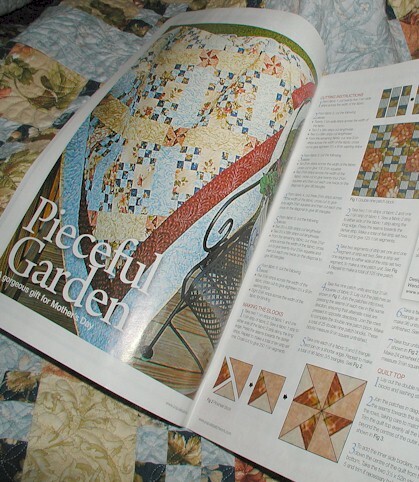 Pieceful Garden is out in the March 2010 Issue of Popular Patchwork. I am so excited!! I hope this is a sign of many more successful ventures in the future. Popular Patchwork magazines are definitely available at your local Barnes and Noble bookstores. Grab your copy today! Being published in the UK has been such a milestone for me. 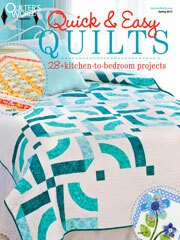 As with all my published quilts, this is another tribute to my quilting teacher, Barbara. Without her, I would not have even known the quilting bug had been lying dormant within me all these years. 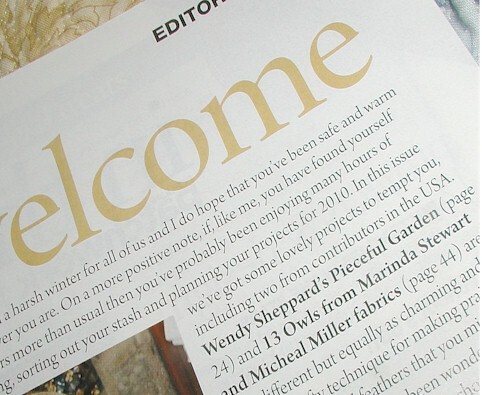 :) I also want to thank Jane, Popular Patchwork’s editor for affording me the opportunity to publish in her magazine. I hope you have had a good visit! Thank you so much for visiting. I love getting your comments. Do drop me a line so that I can visit you back! I wish you splendid start to a new week! 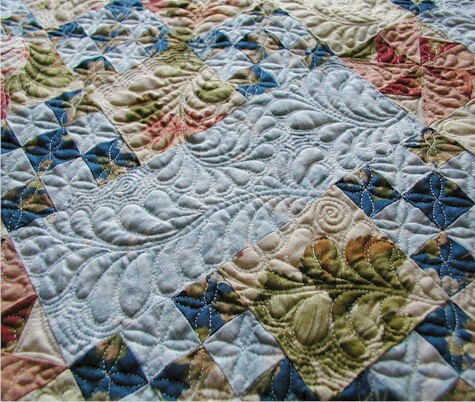 This entry was posted in Quilt Pattern, Quilting, Quilts & Projects: Published, Quilts: Pieced and tagged Bernina 640E, Feather quilting, Free-motion quilting, Pieced Quilt, Popular Patchwork March 2010, Wendy Sheppard. Bookmark the permalink. I love that quilt! Such beautiful work! and I LOVE the pillow! Oh wow Wendy, congratulations! What a beautiful work of art. Not only the piecing but the quilting is outstanding. Wish I could have a lesson with your teacher ;-) I will have to look for the magazine, as I have never seen this publication before. Congratulations on going trans-Atlantic. 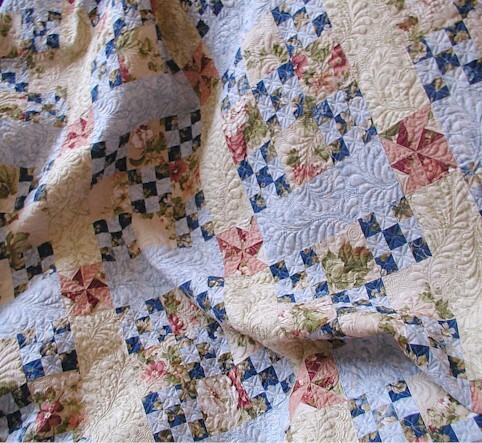 The quilt is lovely and your quilting is beyond belief! A breathtakingly beautiful quilt! Congratulations! I always knew you were an international star!! I am amazed at your Pieceful Garden. It is stunning, and your skill simply amazing. Gorgeous! It´s absolutely stunned! Wow…so beautiful work you have done in that quilt. 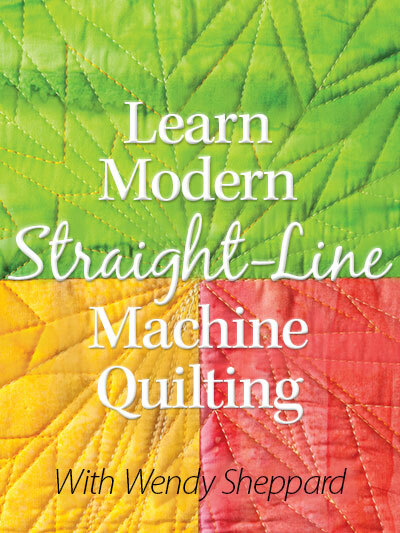 Youre are really good to machine quilt – thought first it was made by a longarm, but no…fantastic! Gratulations with the transanlantic venture – I understand youre proud. The quilt its really really beautiful and I am so much in love with the quilting motifts you used. I will try to get the magazine from UK. Very cheap prices..great. Have order the issue and looking foreward to see it. Its also a great pattern and the pillow you make its also sweet. congratulations on your being published overseas. Your quilting is amazing. I really struggle with doing any quilting on my machine. Oh, how I love that quilt! I can’t decide which I like better~the front or the back! Congratulations, Wendy! I’ve always thought you and your quilts were world class! Bask in the glow…… yay! Wow, Wendy! Congratulations! 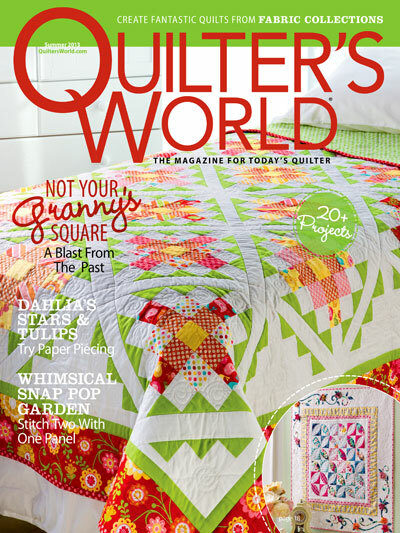 All of us, even us past-time quilters, are envious. We would love to just have a small part of the success you have achieved (especially me!) Beautiful quilt and a wonderful job! Congratulations, Wendy!!! That is such a gorgeous quilt — the quilting is just beyond belief!! 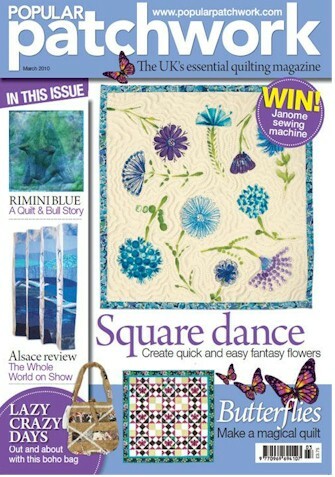 Many congratulations Wendy, how exciting, your quilt is so gorgeous, I will pick up a copy of this magazine. 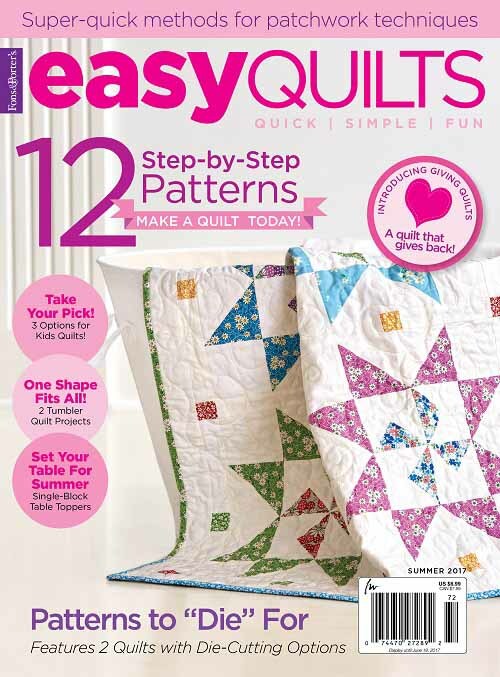 I have always been fascinated by quilting and like the article says, this would be a perfect gift for Mother’s day (mid March here in the UK). 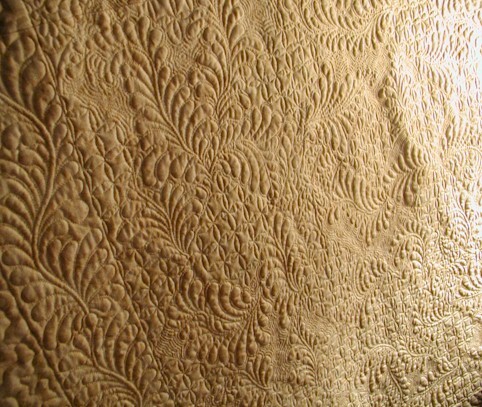 The details on your quilts are so beautiful. :-) Kathy. What a beautiful quilt. I love those colors and the fabric. 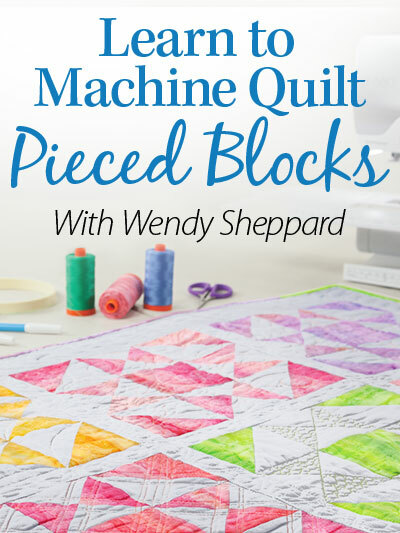 I do my quilts by machine and cannot imagine how you do it. I would love to be able to do that. 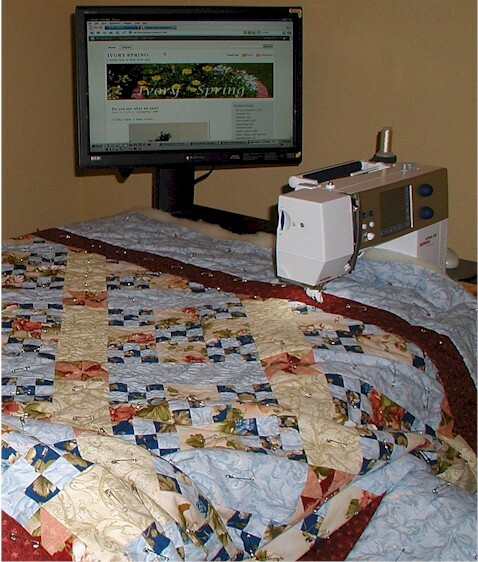 Do you roll your quilt on the side where the machine is while you quilt? 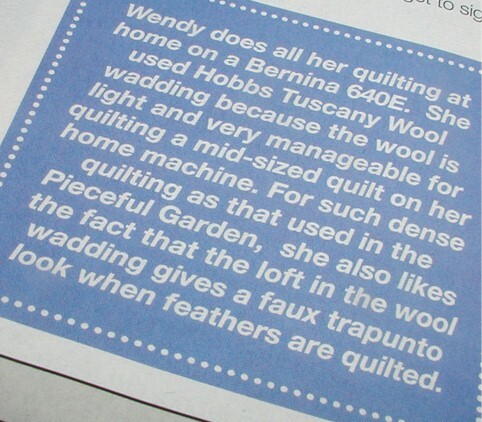 I just don’t see how you can move the quilt freely enough to make those beautiful feathers, etc. Do you have a picture of your set up? I love, love, love the back of the quilt! It is exquisite! Front is pretty too. By the way, I added a “fun blogs to visit” to my blog and put you on there. If you begin your post with a picture instead of words, then your pretty picture shows up on my blog! Congratulations again! I’m sure you will have many more opportunities/successes like this in the future! 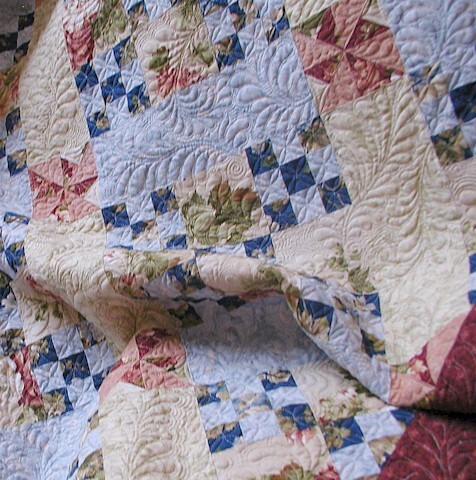 A delightful quilt …. front and back …. the colours you used are gorgeous! Congratulations on the publication. The quilt is beautiful and your quilting is just wonderful. Your quilting is just incredible. Congratulations on being published internationally! That quilt is absolutely amazing – I can’t believe you did that on your home machine, I think I need to come visit and take lessons from you! WOW. 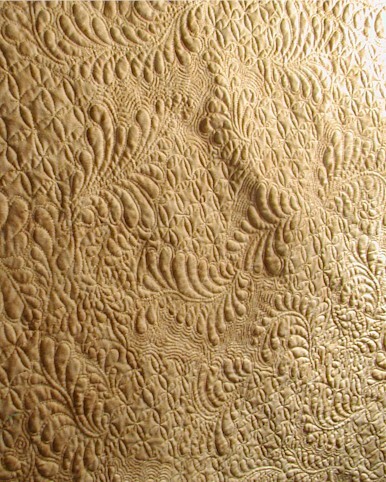 I wish I could do machine quilting like that. Gorgeous! I am going to spend more time admiring your quilts when I get back. I haven’t even unpacked, and I’m out the door again! Congratulations on being published in the UK…that’s fabulous! Your quilt is gorgeous…well done! Congratulations on everything! 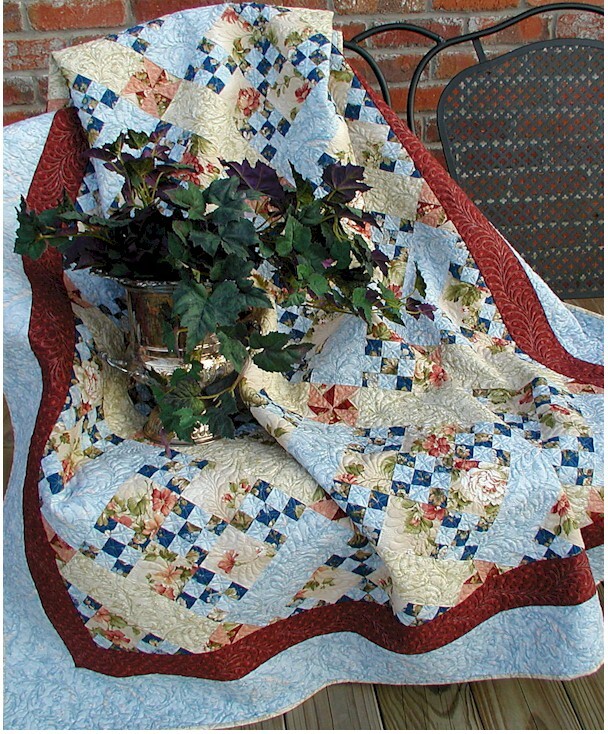 That quilt is stunning….absolutely adored the quilting. How long have you been at this. I only started in Nov. of 08…and have a long ways to go… but your photos inspired me. Look forward to the next post. Wow, congrats on being international! Congrats on opening a new market for your work! The UK readers will love what you do (if they are not already familiar with it from your blog). 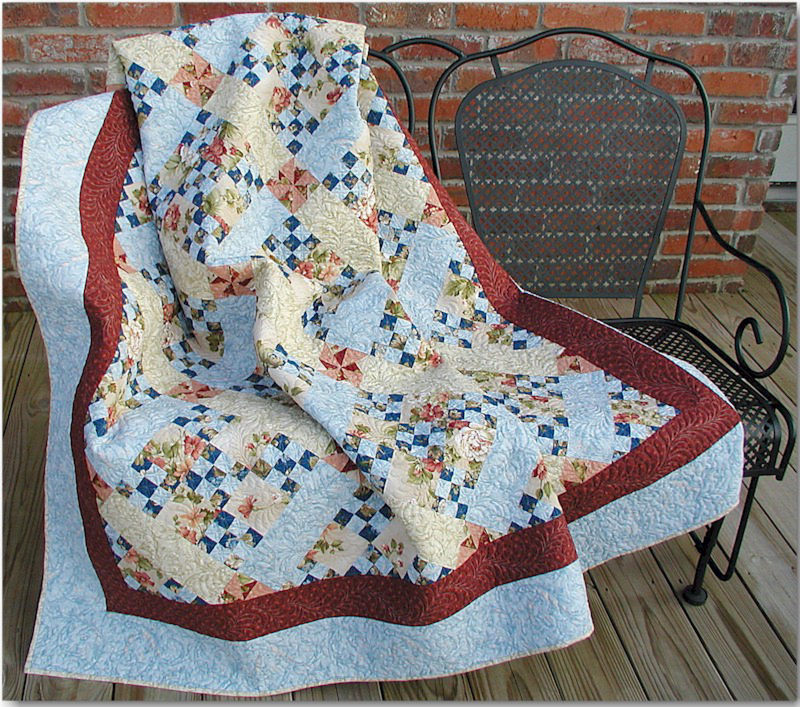 The quilting – OMG – gorgeous! I’m glad you showed the clip from the magazine where you mentioned you use Hobbs Wool batt. I just recently purchased some to try it and now I really look forward to using it after seeing your work. Just beautiful! I can’t see my garden for all the snow that just keeps coming! Congratulations Wendy! As always, your quilting is superb. Wendy beautiful quilt. The quilting is amazing. The back of the quilt looks like Duram Quilting.WOW! Congratulations on your UK publishing! The quilting is just astounding. I love it. Congratulations! The quilt is stunning. 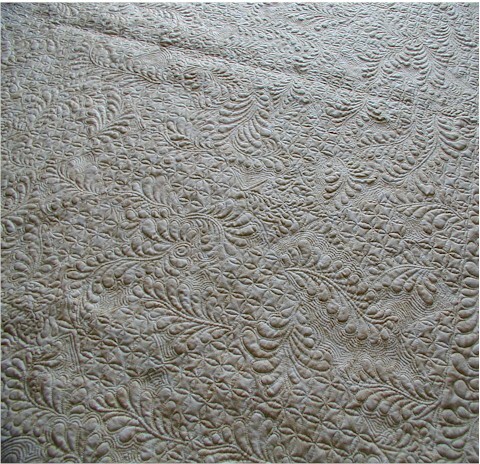 The pattern and the quilting, Awesome! What an accomplishment. I’m sure you deserve every bit of credit. Have a wonderful week. What a wonderful accomplishment Wendy. Your quilts are always wonderful! I can’t believe that you do these on your sewing machine though. What a feat and what beautiful results you get!! Congrats on another success! So happy for you. Your quilt is gorgeous. The quilting is amazing! What an incredible site you have. Congratulations on you magazine article. WHAT a beeeautiful quilt. Your quilting is exquisite. Do you always use a plain muslin backing? 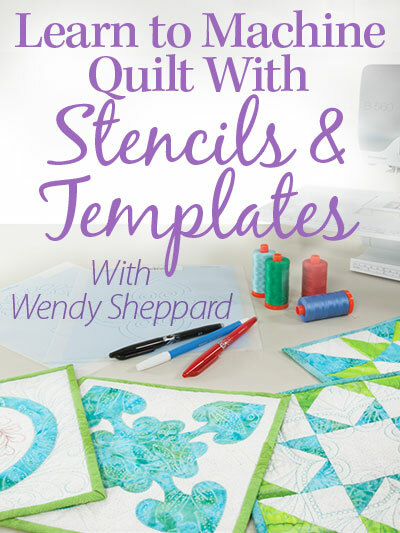 It certainly shows up your quilting to perfection. I am just trying to get my freehand quilting going…and I know what hard work it is. You are lucky you had a great teacher. I have Diane Gaudinsky’s book and am trying to achieve with that. I will certainly be checking the rest of your site, later when I have more time…just wodnerful – I so enjoyed my visit! Congratulations Wendy, beautiful work always!!! I’m using the Hobbs wool for the first time and I really love it, it’s so light. 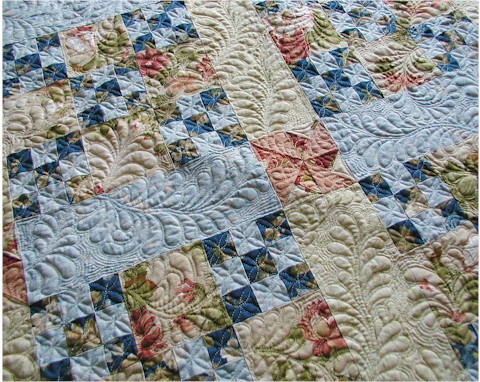 The Piecefull Garden quilt is one of my favourites and the quilting on it makes me want to go stitch on the machine. Thanks for another wonderfully informative post and you deserved the accolades from being published, congratulations. When you do the feathers all over, I would love to know how to tackle going from one to another and also how to put that wonderful swirl at the bottoms.